Made from the best disks everyone else ever made! 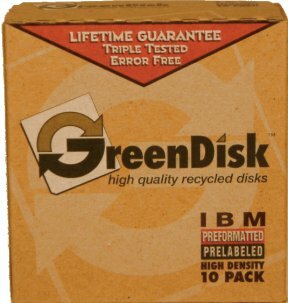 To get a great deal on your favorite brand of diskettes, buy a box of GreenDisks. They're probably in there. GreenDisks are the same premium quality disks normally reserved for software publishers. Working with concerned software companies, we collect the outdated, unsold products that were landfill bound. Then these disks (that have never been in a computer) are erased, formatted, labeled and environmentally repackaged for you. GreenDisks are the best disks for you and the best disks for our planet.